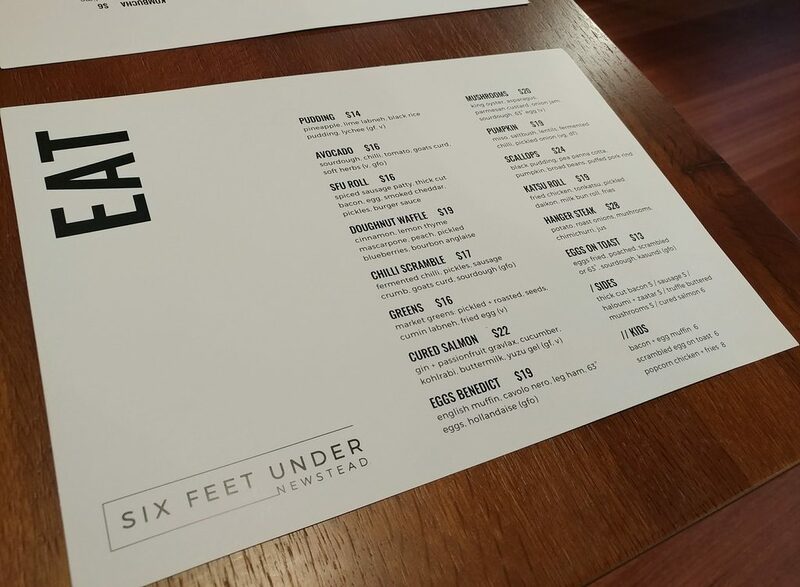 We had kept an eye on new eatery openings while in Croatia, and on our return, decided to try Six Feet Under in Newstead. The pictures of both setting and food had moody hues, and we were curious about what both would be like in person. The door leading into Six Feet Under. More apartment buildings continue to rise in Newstead, and Six Feet Under occupies the ground floor space of one of these. We managed to find a parking space on the street, but at busier times, that may be more difficult. 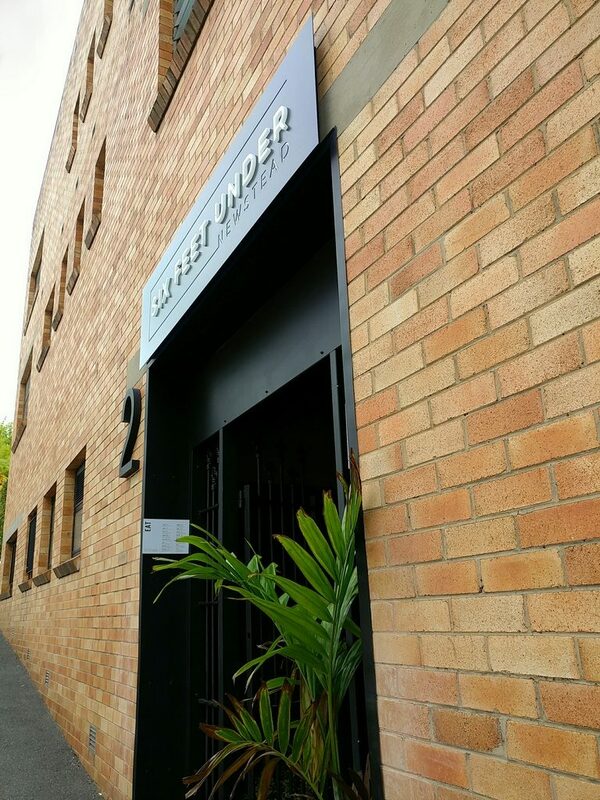 The signage over the door states clearly that it is Six Feet Under. 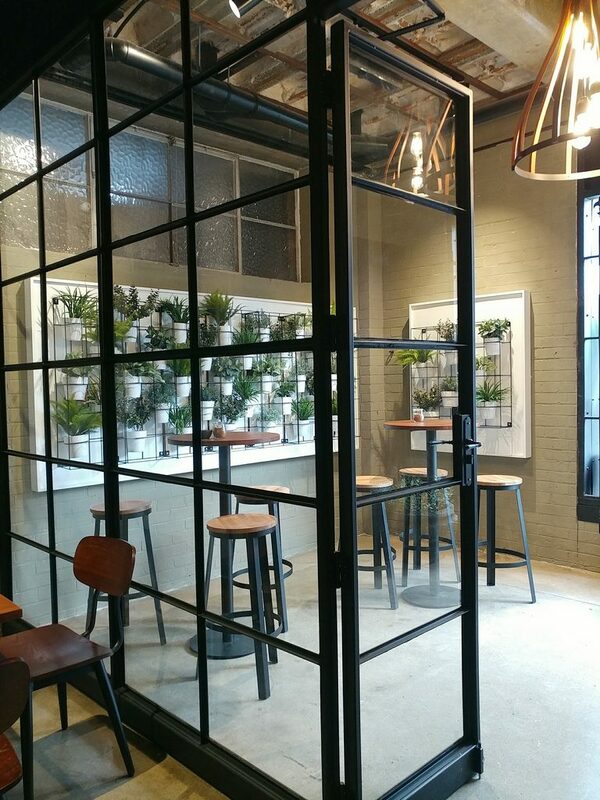 There is a concrete-surfaced antechamber area, with potted greenery on the wall and bar-height tables and stools, then the metal and glass door that leads you into the rest of the eatery. Once through the door, any morbid associations with graves or mortician dramas quickly disappear. The space is unexpectedly expansive, with space to seat over a hundred people. There are different seating sections, with the concrete pillars that are the supports for the tower above punctuating the space and acting as natural dividers. The main area has a polished concrete floor, and another section further back, raised a step up, has wooden floorboards. 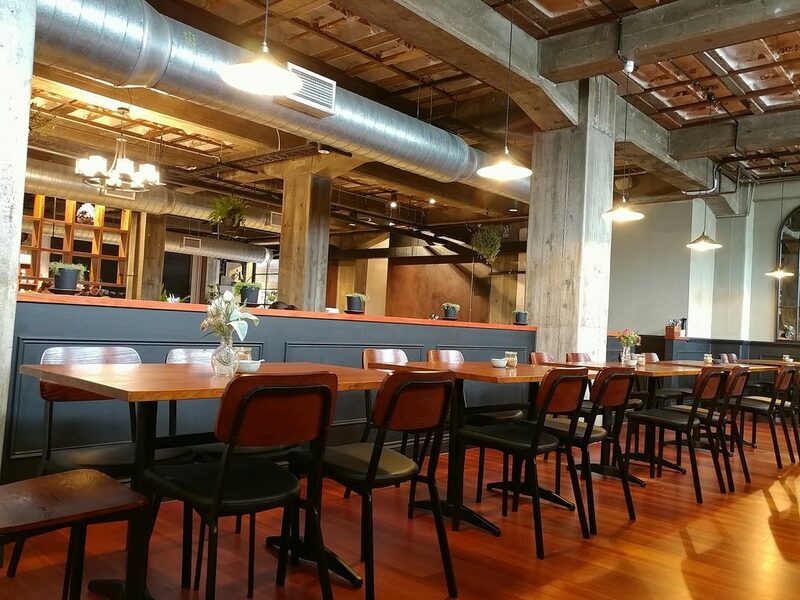 The high, exposed ceilings make it seem even more spacious, and the wooden rafters give it an industrial warehouse feel. Decorative mirrors on the walls add an interest feature, as do the posies of pastel coloured artificial flowers at many of the tables, and the small pots of greenery along the dividers. 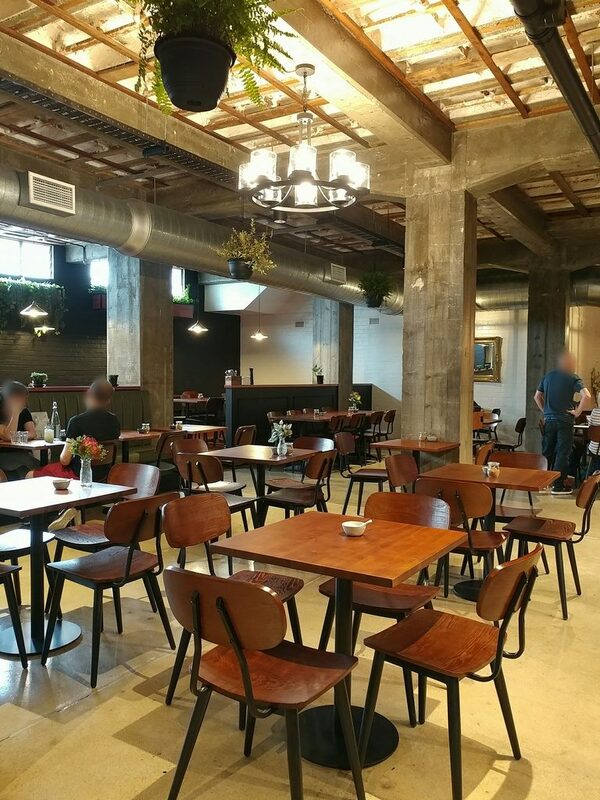 The light fixtures hanging from the ceiling have different styles in different sections, so it doesn’t just seem like one large canteen area. A look at the interior space of Six Feet Under. We were greeted soon after we came through the door. We were invited to sit where we liked, and told that water and menus would be brought to us. We were also asked if we would like sparkling water, and told that it was complimentary. We took them up on that offer, of course. Menus and water were delivered to the table. 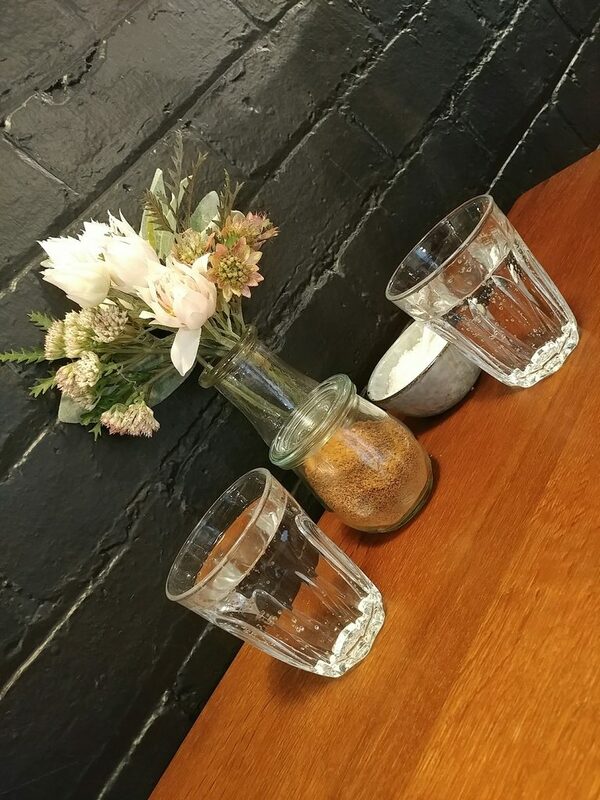 Sparkling water has become a more common offering at Melbourne cafes, but has yet to catch on here, so it was a pleasant find. The cold, carbonated water was refreshing. The table setting, and fizzy water. The menu listed their food options in two columns on a single sheet, in the modern chef’s menu style stating the central component in bold, then listing other ingredients in the following lines. 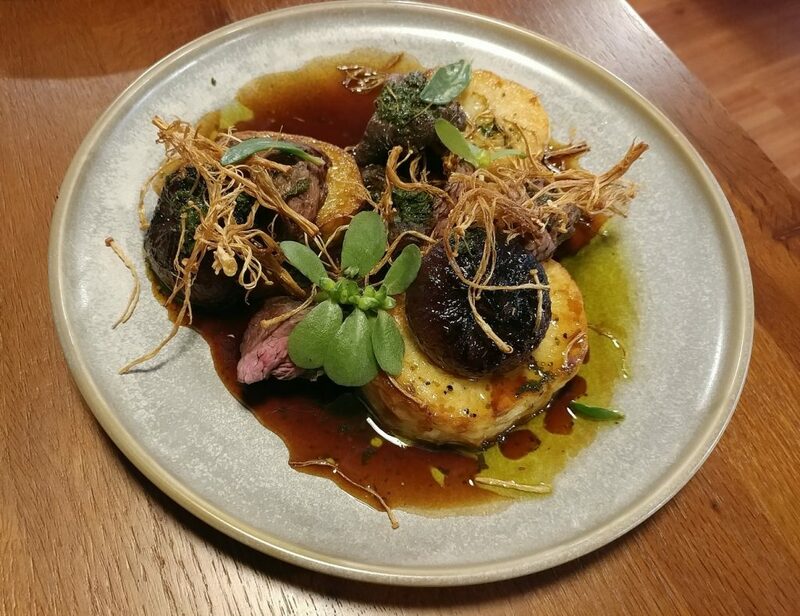 We were immediately drawn to the Scallops and Hanger Steak dishes. 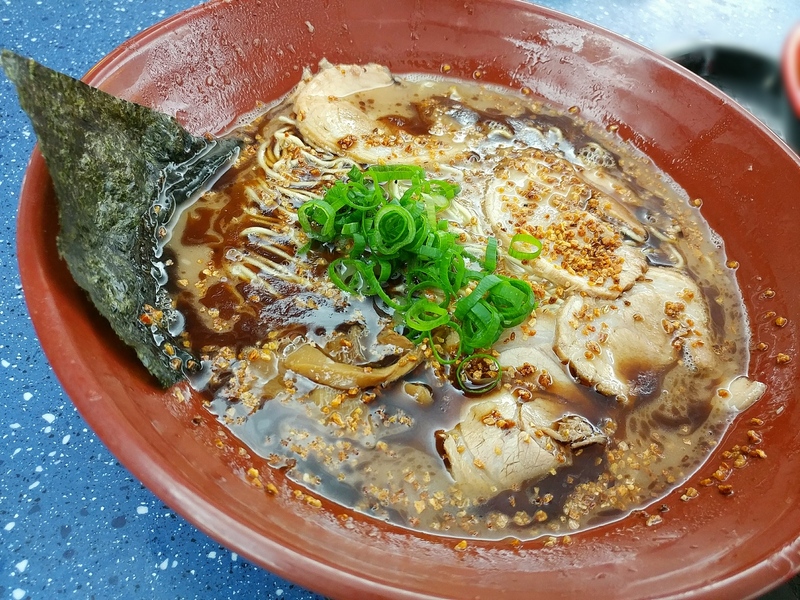 We tried to check the internet for prior impressions of the dishes, but then found that being in a basement level of a tall building with thick walls meant that internet reception did not get through.. We had to just hope we had chosen well. We also ordered coffees, of course. The menu, with food on one side and drinks on the other. It wasn’t packed when we were there, but even then we noticed that it was an echoey space. It is likely to be noisy when more crowded, as the hard surfaces just bounce the sound around, without anything to soften it. Upbeat house music was playing in the background at not too loud a volume. While it was starting to be warmer summer weather outside, we did also find that the air conditioning was quite chilly. Another section of the interior. You can just see the edge of a large mirror at the end. Coffees were brought out after a while, transferred carefully to the table so as not to spill any. 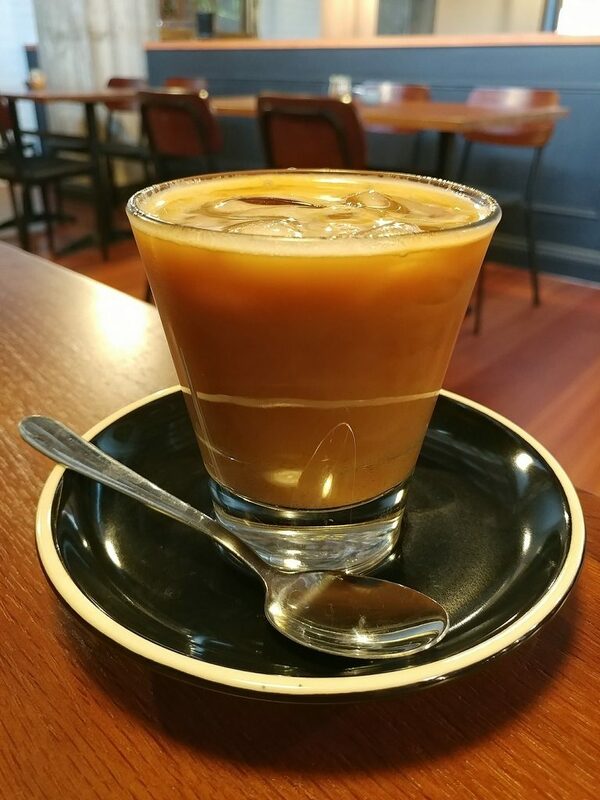 The large flat white had well-textured milk. It had berry notes, but was a little bitter on the finish. 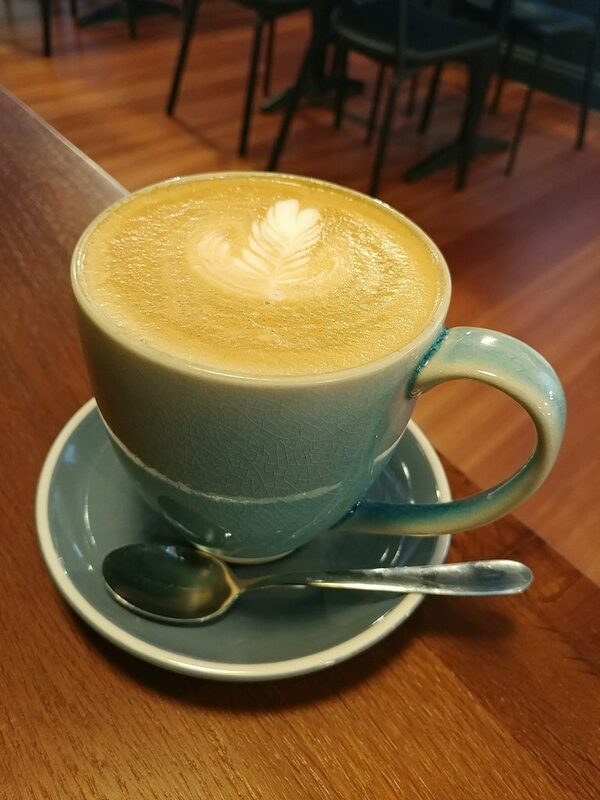 The large flat white, in a mug. 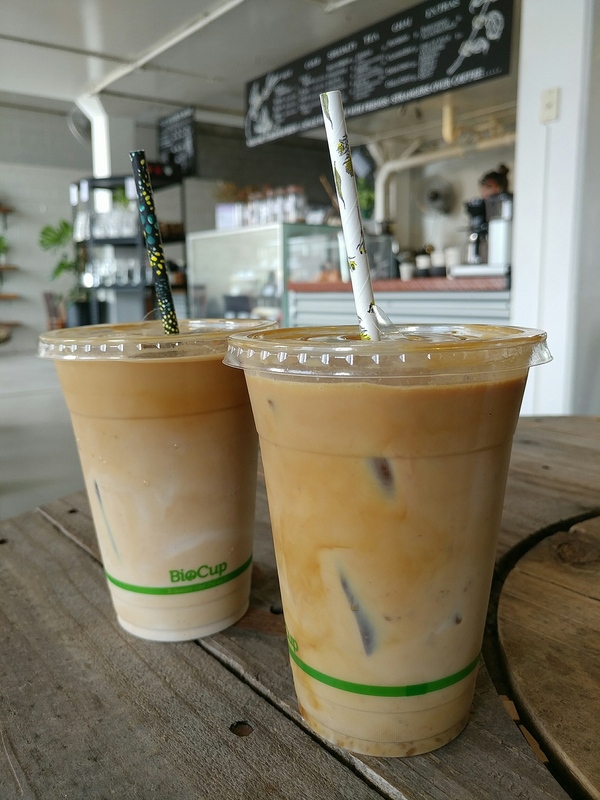 The iced latte had fruity, quite acidic notes, and unfortunately was bitter as well, and noticeably more so. We did ask for it to have more soy milk added, to try to temper it, but it was still bitter after that. 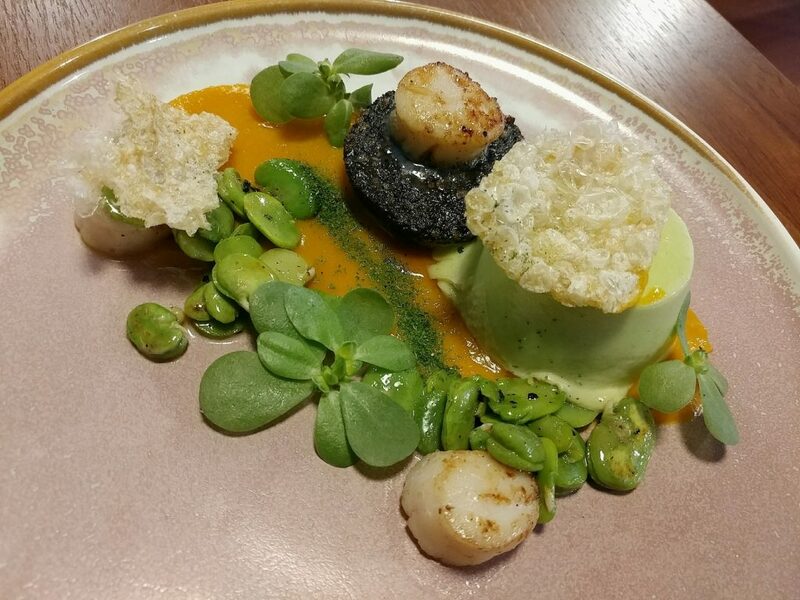 The Scallops dish was listed in the menu as also having black pudding, pea panna cotta, pumpkin, broad beans, and puffed pork rind. We were markedly underwhelmed by the serving size when it was brought out. Although it was prettily presented, the ingredients were scant, and the plate was more negative space than food. 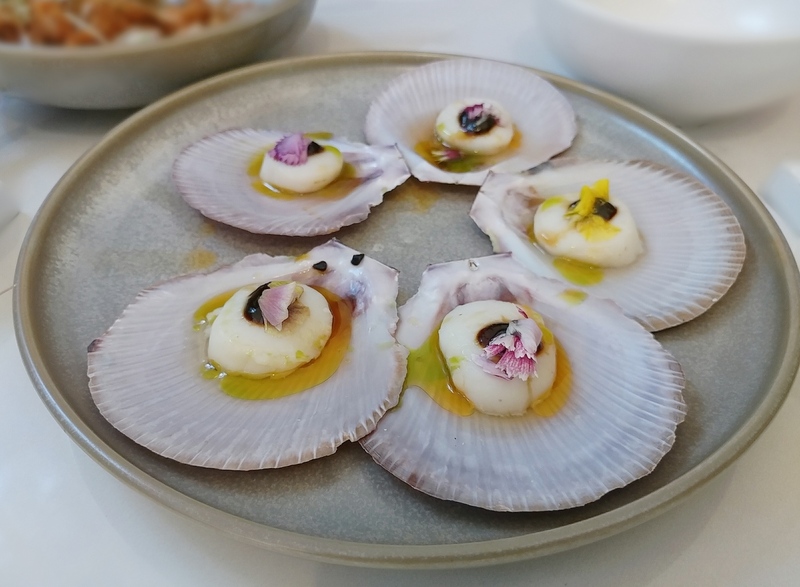 Despite being the headline ingredient, there were only three small scallops on the dish, about the size of 20c pieces, and, disappointingly, overcooked and chewy. 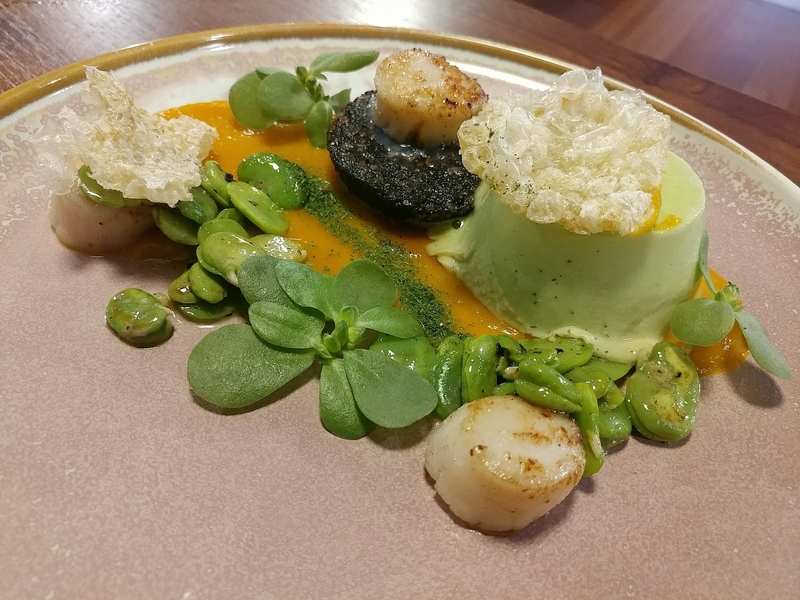 The pea panna cotta was actually the largest component of the dish. 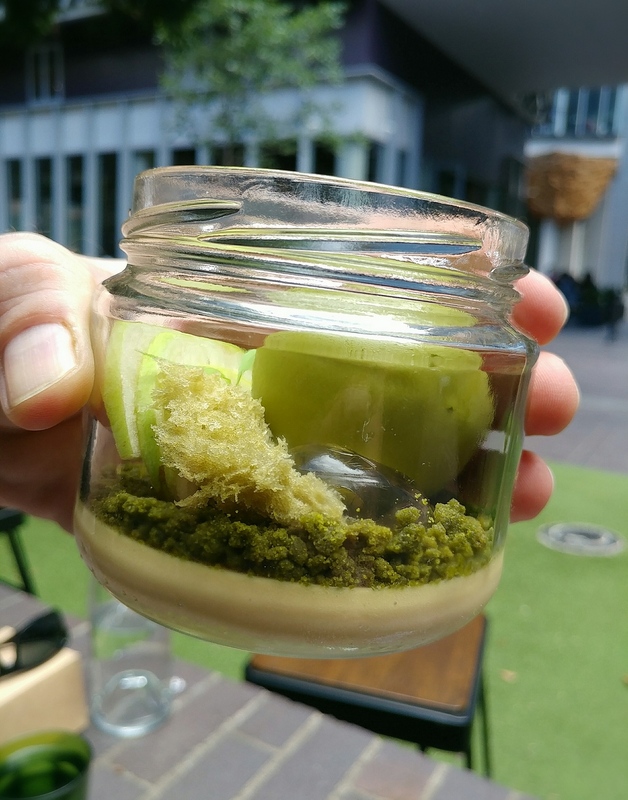 It was soft and smooth, and had the right panna cotta texture. The flavour was naturally sweet from the peas it had been made from, but also a little savoury. The black pudding was soft, and while not gamey, had a lingering faint sourness. The pumpkin puree was smooth, lighter and less creamy than one would typically get, and more of a raw pumpkin flavour as well. The broad beans were just cooked, so they had a firm texture, rather than being mushy. The puffed pork rind was airy and light, and quite like a rice crisp. It was not oily. It also wasn’t seasoned though, so was oddly tasteless, adding just texture to the dish. On the whole, the dish had muted, rather than punchy flavours, and they were flavours that didn’t really work together. It was insubstantial and unsatisfying. 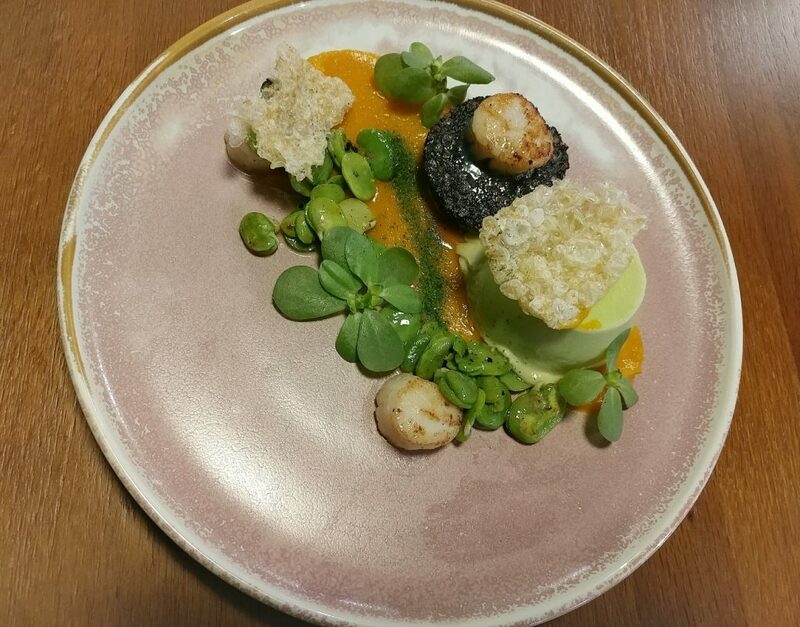 The dish of Scallops, black pudding, pea panna cotta, pumpkin, broad beans, and puffed pork rind. The dish, closer up. Prettily plated, but we wished there was more to it. 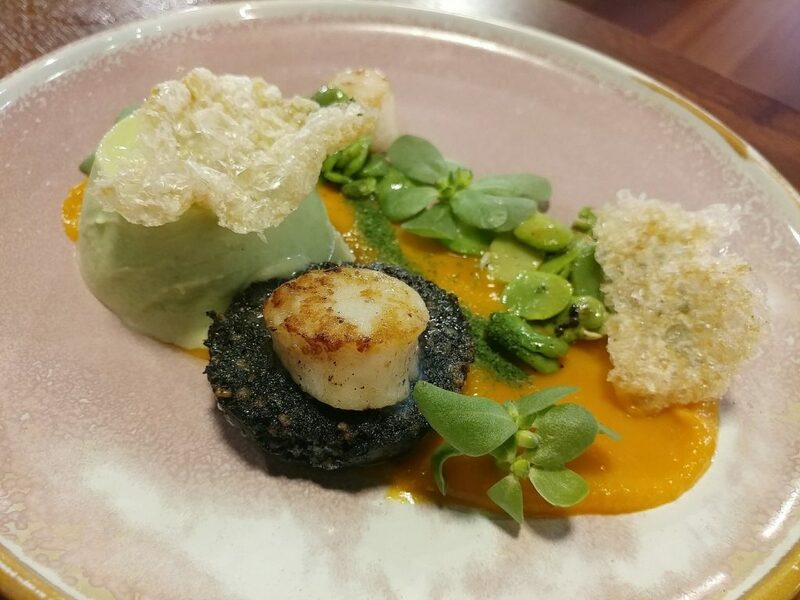 The dish from the other side, showing the black pudding and pork rind components a little better. One more look at the dish. 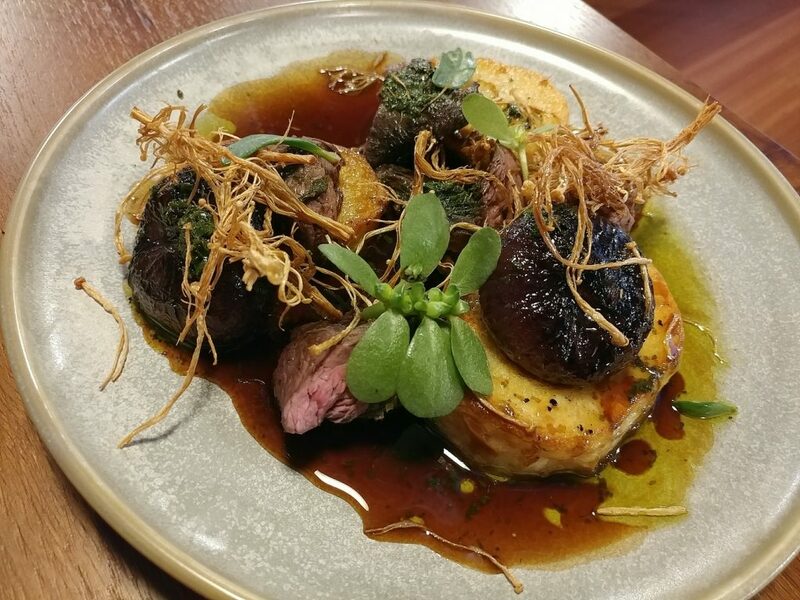 The Hanger Steak dish was listed as having potato, roast onions, mushrooms, chimichurri, and jus. 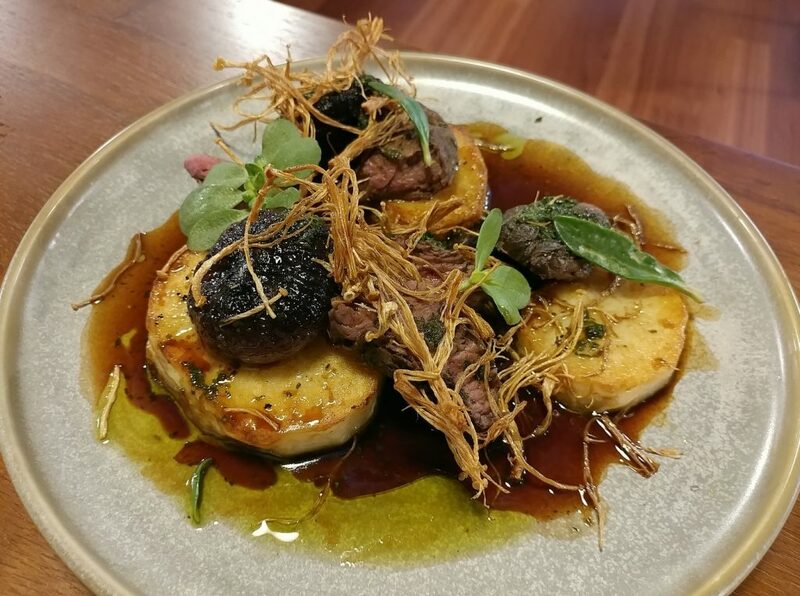 This too, was nicely presented, with the potato and meat pieces sitting in a puddle of jus, and topped with fried enoki mushrooms. Again, there was less meat on the plate than anticipated, with the greatest mass of ingredients on the plate being the potato rounds. The meat was chewy, rather than tender. The chimichurri was herby, but had only a little zing. The jus had berry, fruity notes, and was a pleasant flavour. The onions were soft and caramelised so that their sweetness was released. The previously mentioned potato rounds were thick, browned on the outside, and soft on the inside without being dry. This was not a bad dish, but again was expensive for what we received on the plate. 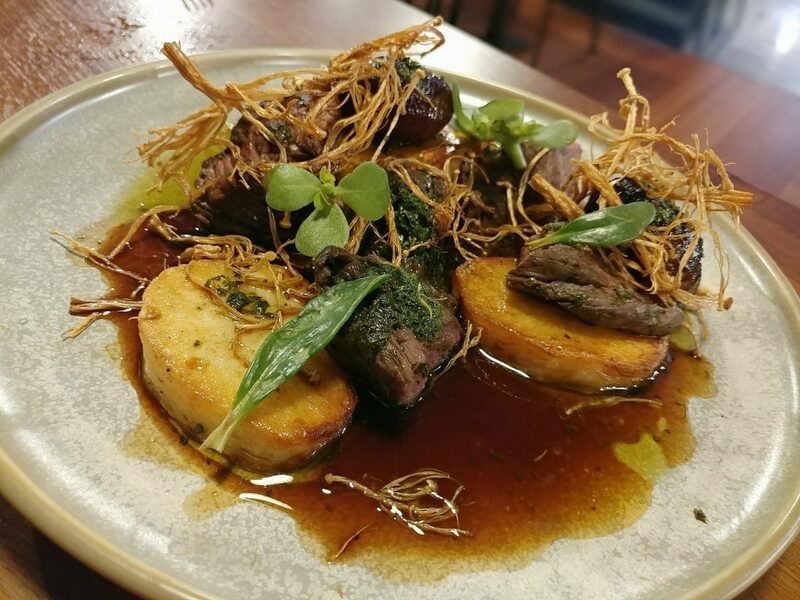 The Hanger steak, with potato, roast onions, mushrooms, chimichurri, and jus. The dish closer up. The big brown lumps are the onions. The dish from another angle. Spot the meat. Some meat seen here. But more potatoes. The waitstaff were cheerful and efficient. The setting of Six Feet Under is lovely, and they have clearly invested money in the fitout. The food is prettily plated. Where it doesn’t deliver though, is the food, and that, for an eatery, is a problem. 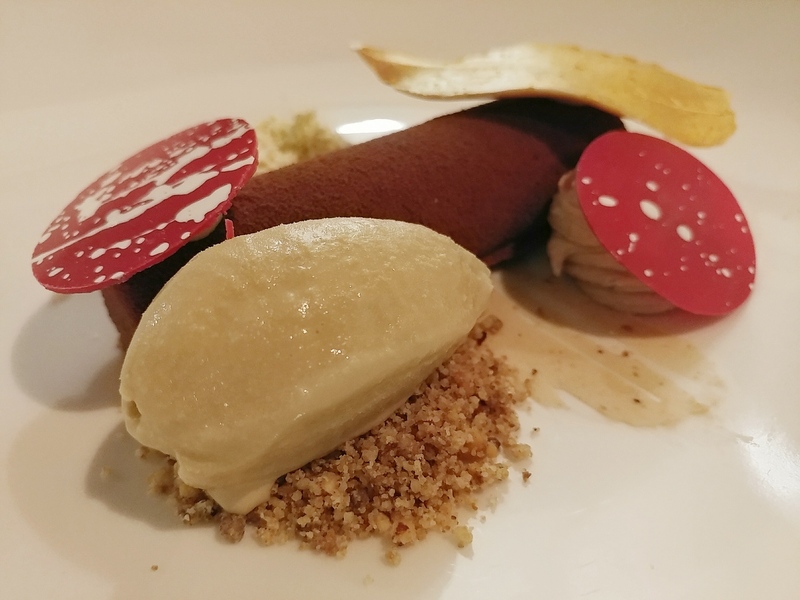 Both of the dishes we had were expensive, at $24 for the Scallop dish and $28 for the Hanger Steak dish, compared to pricing at other eateries for brunch or lunch dishes, and what we got on the plate didn’t seem to justify the prices. It was so lacking, in fact, that we went to Betty’s Burgers afterwards. While we understand that one does have to pay more rent in the Newstead area, shortchanging your customers doesn’t seem like a good way to balance the books long term. 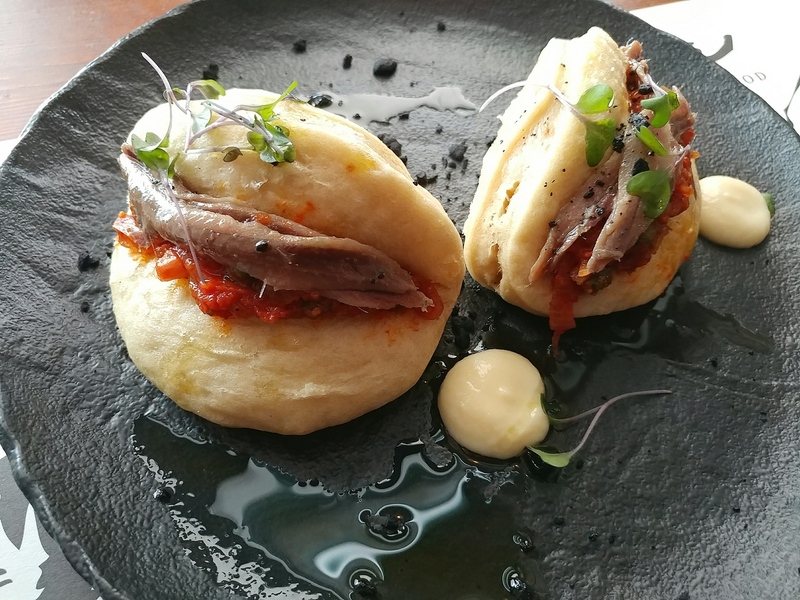 In an increasingly competitive restaurant market, they will have to deliver better value to establish a steady customer base. With what they currently serve though, they have lost us. Price point: $14 to $28 for more than eggs on toast. It was hit and miss..but more misses than hits, and we would be looking for a better strike rate when forking out those prices.. And sorry, due to a fair bit of spam, comments are held from posting until approval.